With all the talk of terrorism, corruption and intolerance directed at Russian President Vladimir Putin and the International Olympic Committee in the months leading up to the 2014 Sochi Winter Olympics, it must be a temporary relief for them that the world can now focus on the record number of athletes and world dignitaries converging upon the Black Sea resort. On Friday, the opening ceremony will take place at the 40,000-seat Fisht Olympic Stadium. The $603.5 million venue was designed by American sports architecture firm Populous and U.K. design consultancy Buro Happold - read on for a closer look! The Fisht Olympic Stadium was inspired by the famous jeweled Fabergé eggs that were originally made for the wives and mothers of Russian Tsars Alexander III and Nicholas II as Easter gifts. The roof is designed to look like snowy peaks so that it blends in with the backdrop of the Imeretinskaya Valley and the Caucasus Mountains. German construction company Vector Foiltec built the roof with their transparent plastic Texlon® ETFE (ethylene-tetra-fluoro-ethylene) air-filled cushions. At night the stadium will create spectacular displays using LED lighting. 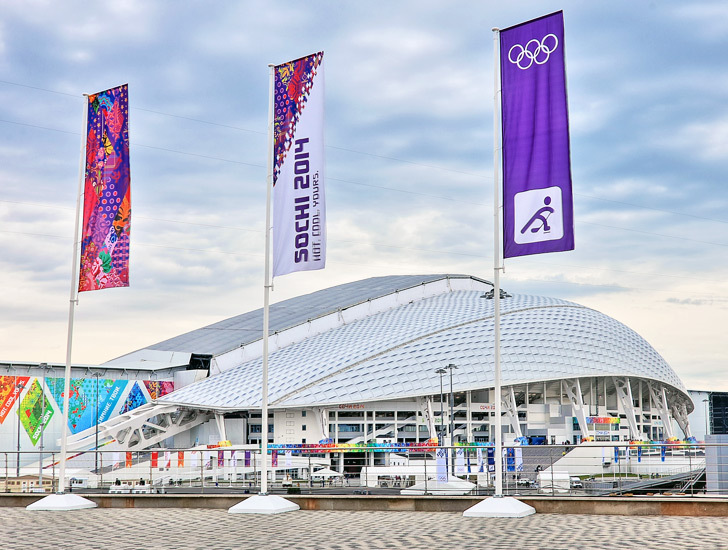 The stadium will host the opening and closing ceremonies, and after the Olympics it will be used as a training center and match venue for the Russian national football team. Fisht was also chosen as one of 11 stadiums to host matches for the 2018 FIFA World Cup. The design of Fisht Olympic Stadium was inspired by the famous jeweled Fabergé eggs that were originally made for the wives and mothers of Russian Tsars Alexander III and Nicholas II as Easter gifts. 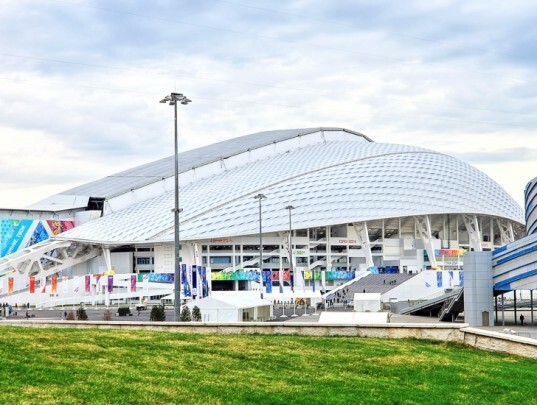 The roof of Fisht Olympic Stadium was designed to look like snowy peaks so that it blends in with the backdrop of the Imeretinskaya Valley and the Caucasus Mountains. 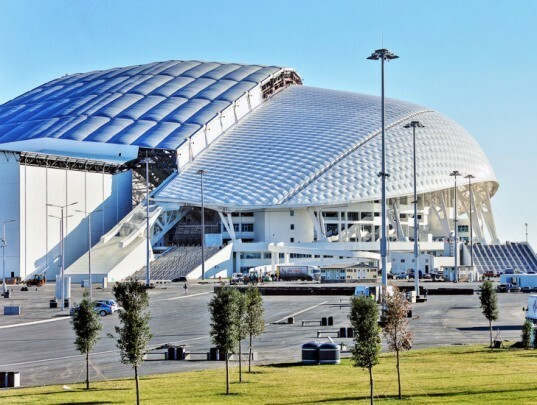 German construction company Vector Foiltec built the roof of Fisht Olympic Stadium with their transparent plastic Texlon® ETFE (ethylene-tetra-fluoro-ethylene) air-filled cushions. At night Fisht Olympic Stadium will create spectacular displays using LED lighting. Fisht Olympic Stadium will host the opening and closing ceremonies, and after the Olympics it will be used as a training center and match venue for the Russian national football team. Fisht Olympic Stadium was also chosen as one of 11 stadiums to host matches for the 2018 FIFA World Cup.